Double Dragon V: The Shadow Falls is a 1994 competitive fighting game developed by Leland Interactive Media and published by Tradewest for the Sega Mega Drive. It was also released for the Super Nintendo Entertainment System and Atari Jaguar. The change in genre from the side-scrolling beat-'em-up format of the previous games to one-on-one fighting was due to the popularity of games such as Street Fighter II and Mortal Kombat at the time. Despite the title, Double Dragon V has no continuity with the previous games in the series and was actually a tie-in to the Double Dragon animated series airing at the time. The unusual numbering was due to the existence of Super Double Dragon, a Super NES-exclusive game in the series that was released in 1992, although former series' developer Technos Japan had very minmal involvement with Double Dragon V and the game was never sold in Japan. An unrelated Double Dragon IV would later be released for the PlayStation 4 and PC in 2017. The game plays similarly to Street Fighter II' as jumps and pressing away from the opponent will block incoming attacks. There are three punch buttons and three kick buttons which must be toggled between on a 3-button controller by pressing or are available immediately on a 6-button controller. The three punch and kick buttons comprise of weak, medium, and strong attacks. Using combinations of buttons can trigger special moves such as fireballs and thrust attacks. There are also finishing moves called "Overkills" which is a basic attack that triggers a unique death animation. Four game modes are available. This includes Tournament Mode (Arcade single player Mode), Vs. Battle (2 player vs. mode), Quest Mode (Story mode), and Battle Demo Mode (Watch 2 CPU opponents battle). There are twelve available characters of which two are hidden. Of the twelve Bones, Sekka, Blade, and Dominique are original characters that never appeared on the television series. 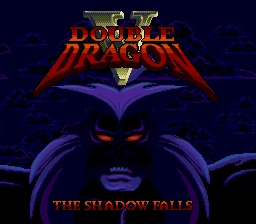 Main article: Double Dragon V: The Shadow Falls/Magazine articles.